Are Sugary Marshmallows Scary to Your Teeth? Doug: Recently, our local Target has had those wonderful monster cereals from General Mills for sale -- of course I'm speaking of Count Chocula, Frankenberry, and Boo Berry! Even after all these years, they are still a treat, and yes -- at the ripe old age of 44 I am enjoying them with my 16-year old son! Have a look at the modern cereal boxes if you haven't seen these, and check out the 1970's commercial below for an extra treat! Have a great day! "Come On In, the Revolution's Fine!" Doug: Welcome back to our second annual installment of looking at Halloween in the burg of Rutland, Vermont. You may recall that last year we inspected Avengers #119, where the Collector spoiled the festivities at Tom Fagan's annual superhero-themed costume parade. This time we trip back a few years earlier to find that other super-baddies had also spoiled some fun along the way! 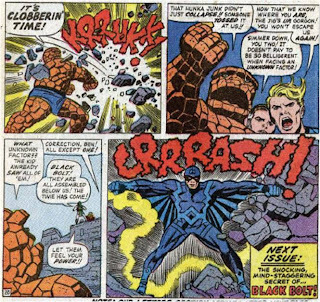 Doug: I have to say right off the bat --the artistic pairing of John Buscema and Tom Palmer may be akin to Lennon and McCartney, or Hope and Crosby, or any of the other great duos of our time. 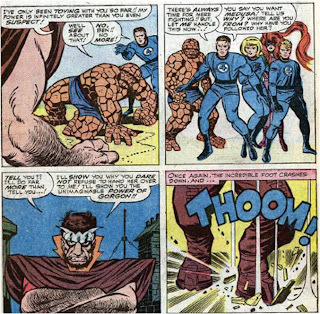 Yeah, I know Buscema sometimes missed on certain facial angles, but his dynamism just added so much energy to every page -- find me a page (shoot, find me a panel!) in this book that doesn't just exude action! And Palmer -- this was the era of experimentation by inkers, and the use of zip-a-tone throughout this book just stretches the moody parts, adds depth to the night scenes, etc. These are two guys at the peak of their powers as the Bronze Age dawned. Karen: This is just a flat-out gorgeous looking book. The big spread on pages 2 and 3 is an iconic image. One of the other things that struck me is that there are no "throw-away" panels in this book. Every single panel shows an attention to detail that has to be seen to be believed. Karen: That particular bit of dialog is painful to be sure. But the whole issue feels so hokey. Women's liberation was definitely an important topic as the 70s dawned, but the entire story feels so dreadfully out of touch. I'm not even sure what Roy was trying to say about the women's movement here. Doug: As we get rolling, Jan arrives home to Avengers Mansion to hear voices coming from the meeting room. Thinking she'll surprise them, scare them, whatever -- she peeks around the corner to find that it's not her teammates in the room (well, at least not all of them), but a different team of all females! 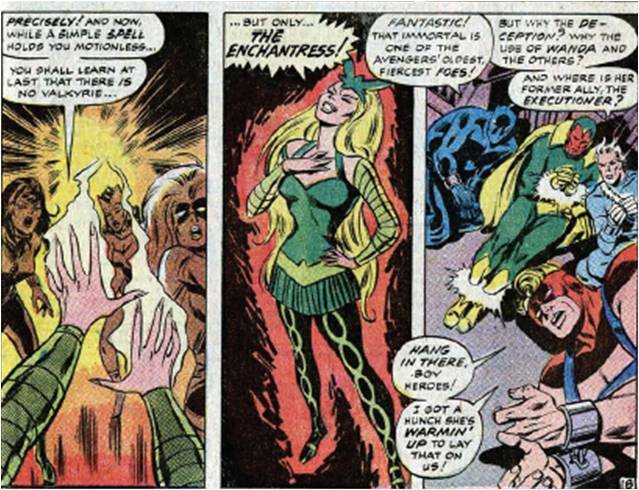 Seated around the table are Medusa, the Black Widow, the Scarlet Witch -- while at the head is a strong, Viking-looking woman who calls herself the Valkyrie! The two-page splash here is not only beautiful, but contains what would become stock images for the Wasp and Valkyrie -- I believe both adorned Slurpee cups back in the mid-70's! Doug: Jan grows to her normal height, and the others ask her to hear out the Valkyrie. As the woman warrior begins to tell her origin, I had the stinking suspicion that something was off here. These are strong female characters (by this time -- certainly not as Stan Lee had written them years earlier), and they just seemed to be going along with the whole "male chauvinism" deal a bit too easily. But Valkyrie proves to be a master propagandist, and the ladies set off on whatever mission she has. Karen: Another remark on the art: I love that horse-drawn chariot that Valkyrie drives. 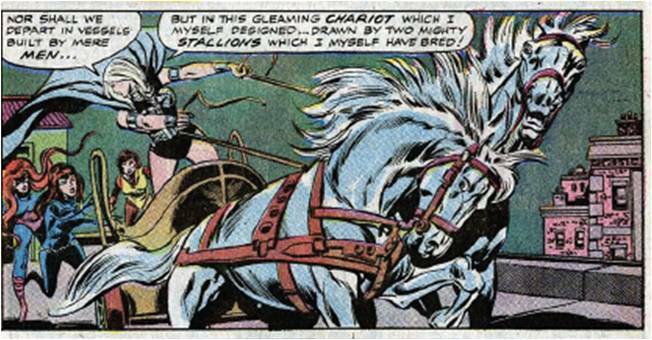 Man, could Buscema draw horses! Doug: We then cut to Rutland, Vermont, where Tom Fagan and others are gathered, awaiting the start of the 11th annual Rutland Halloween parade. 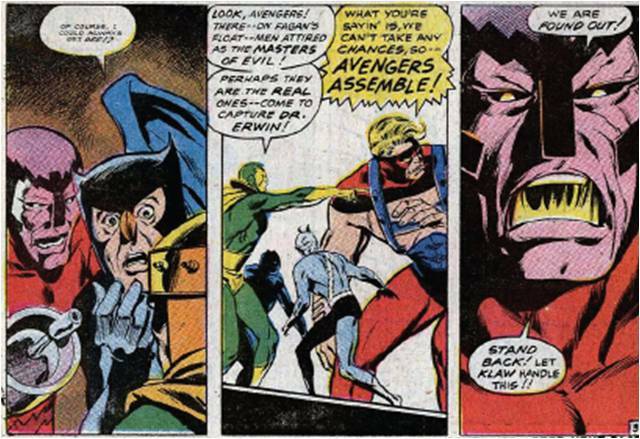 As fate would have it, the Avengers show up -- Vision, Goliath, Black Panther, and Quicksilver. The Panther tells of a potential kidnapping plot as the heroes' reason for journeying north. Party guests Roy and Jeannie Thomas make a cameo, and Fagan invites the Avengers to ride on a parade float. Karen: It's amusing to see the regular joes in costumes that hang on them, unlike our powerfully-built heroes! I also noticed a certain dark-knight detective hanging out in the crowd. Doug: We then greet the Masters of Evil, reassembled after busting out of jail. Klaw, Whirlwind, the Melter, and the Radioactive Man have come to Vermont to steal a device that would allow access to parallel time! In the parade is Dr. T. W. Erwin, and with him is the machine that powers his precious device. As the Masters move, they are immediately found out by our heroes and a melee ensues. However, as powerful as this group of Avengers is, they are overwhelmed somewhat easily. The Vision, in particular, is taken out of the fight quickly by being enveloped in melting tar -- he fears that to turn intangible would damage his circuitry. 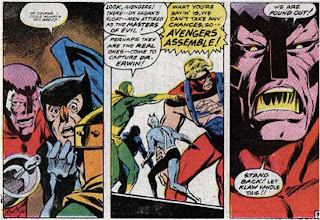 The most intriguing battle is Quicksilver vs. Whirlwind, and I wish we'd seen more of it! Karen: Anyone familiar with H.P. Lovecraft would take note of the fact that Dr. Erwin is from Miskatonic University! Who knows what horrible creatures he might have let into our world with his device. That crazy Roy! Karen: I agree that our male heroes are downed a bit quickly, all so that they can be rescued by the ladies. It's a tad too obvious. Doug: The cavalry arrives, and wouldn't you know that girl-power wins and wins quickly. But right when we think that we're going to be treated to a little boy-girl debate, Valkyrie steps from the shadows, blasts the gents off their collective feet, and tells the prof. to take everyone to the parallel time machine. 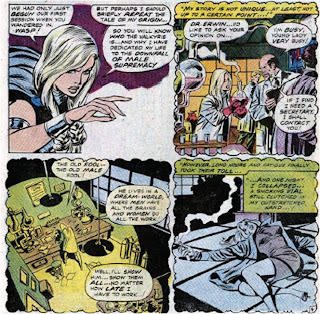 In the fastest transition ever, the very next panel (not page, mind you) shows the assembled heroes in the professor's laboratory and Valkyrie draped all over the machine. She quickly begins to glow and then change before everyone's eyes, and emerges from all of the commotion as the Enchantress! 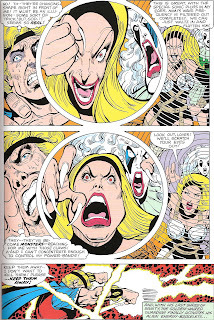 Doug: To wrap this up, Amora details how Odin banished she and the Executioner, and depowered them both. When the Executioner left her, she swore revenge on all males. Making her way to Earth, she disguised herself and gave her would-be allies small spells of suggestion to make them go along with her. And as she moved to work the machine, which would take her back to Asgard where she would wreak more havoc, Wanda resisted her. Wanda's hex sphere (see, no one really knows how her power works!!) 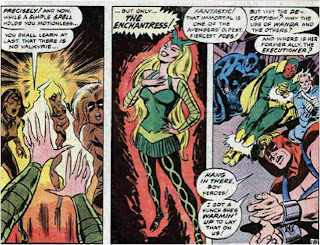 turned the Enchantress' spells upon herself, seemingly disintegrating her. And that was that. Until, of course, Clint had to shoot off his mouth about women's lib! 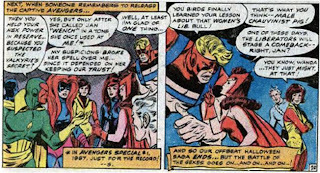 Karen: And of course, a few years later, Clint would tell Wanda he wanted to be the father of her "little witch-brood"! He's a charmer, all right. Project Pegasus: Battlin' Babes on the Loose! 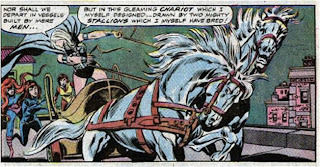 Karen: This is part 4 of our look at the Project: Pegasus storyline, and this issue focuses on Thundra. Introduced back in Fantastic Four #129, Thundra is a warrior woman from an alternate future where society was divided along genders. Her people, the "Femizons" had genetically enhanced Thundra, granting her incredible strength. 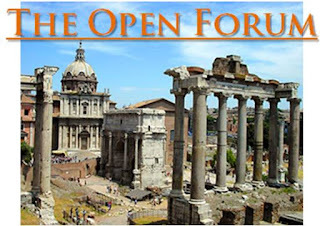 Originally she traveled to our time to battle Ben, whom the Femizons believed to be the strongest man of all time. They did fight, again and again, and Thundra became interested in Ben romantically, although this was never reciprocated by Ben. Karen:We also have new artists starting with this issue. 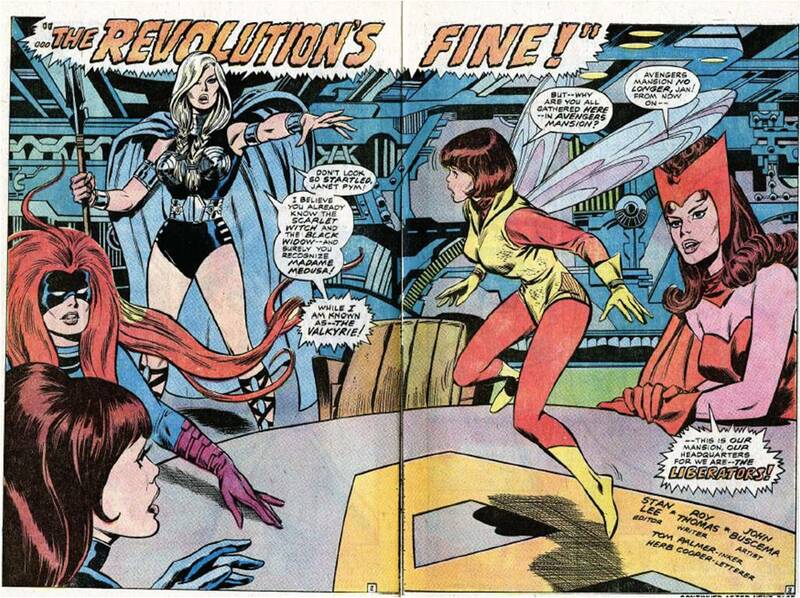 George Perez and Gene Day take over from John Byrne and Joe Sinnott, and they do an outstanding job. So often second or third tier books like MTIO would suffer from very weak art, but that's certainly not the case with this series of stories. 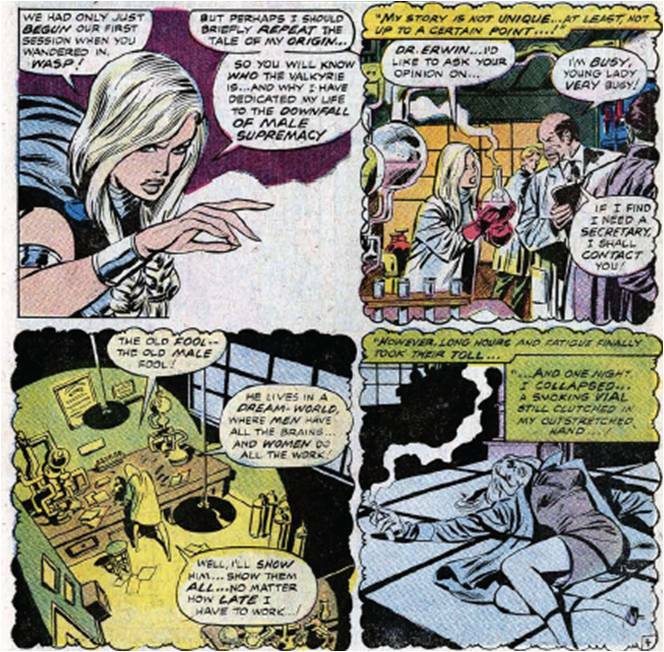 Karen: When the issue opens, we see that Thundra and the female wrestlers from last issue are breaking into Project Pegasus. In flashback, we are told that a mysterious man made her an offer she couldn't refuse to plant a device within the Project. However, once she and her team have placed the device, the lady wrestlers take off deeper into the complex, stating they have other orders! Doug: Assembling those gals for the mission was sort of like a Dirty Dozen, wrasslin' style! 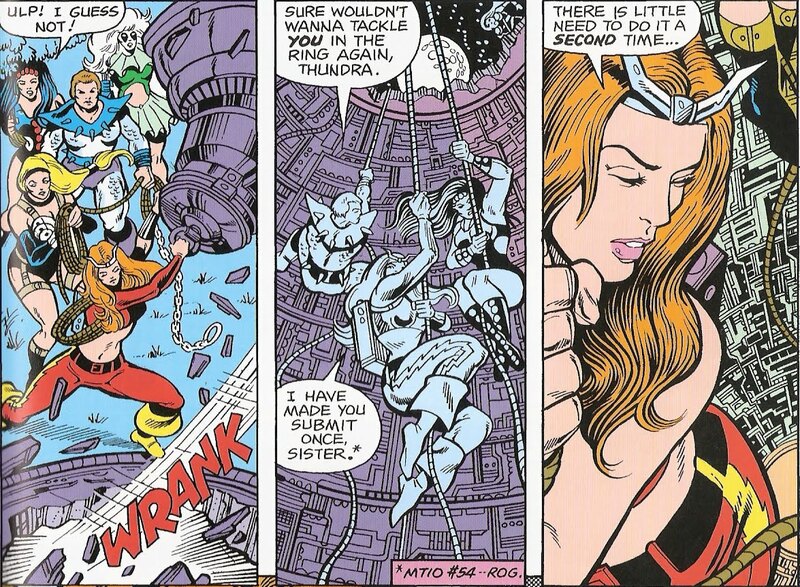 Thundra would definitely be an example of all brawn/no brains, wouldn't she? Karen: We get a quiet interlude with Ben visiting the still-comatose Wundarr. 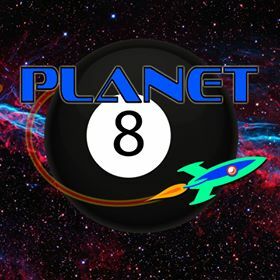 Ben is feeling guilty for allowing the scientists to use Wundarr in their experiments, and tells the man-child how sorry he is, and then quickly leaves before he starts to breakdown. After Ben exits the chamber, we see Wundarr lift his head and say, "Ben, I understand." Doug: There have been some touching moments with Ben in this story -- it's a very human look at him. 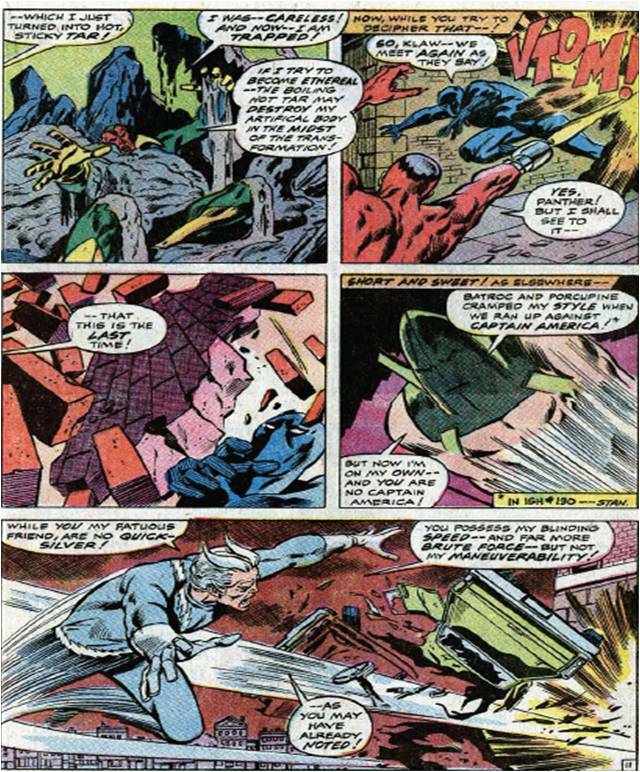 It just goes to show that anyone with talent can write any character -- sometimes we complain about certain writers not finding a character's "voice"; that just isn't the case here with scribes Macchio and Gruenwald. It looks like they've done their research, and stretched what they found just enough to make it their own. Karen: Who should Ben run into after he leaves Wundarr but Thundra. When she refuses to come with him, the two get into another donnybrook, with Ben at a disadvantage due to to his injured arm (the one Deathlok blasted a few issues back). Doug: I liked how Ben was startled at seeing her, but in that "Oh, crap..." way; he just knows when she shows up something stupid is going to happen. And it did. Karen: As Ben and Thundra tangle, we pop in on Quasar and Giant-Man, who are cleaning up after the previous issue's fight with Nuklo. An alarm goes off -the female wrestlers have been detected. 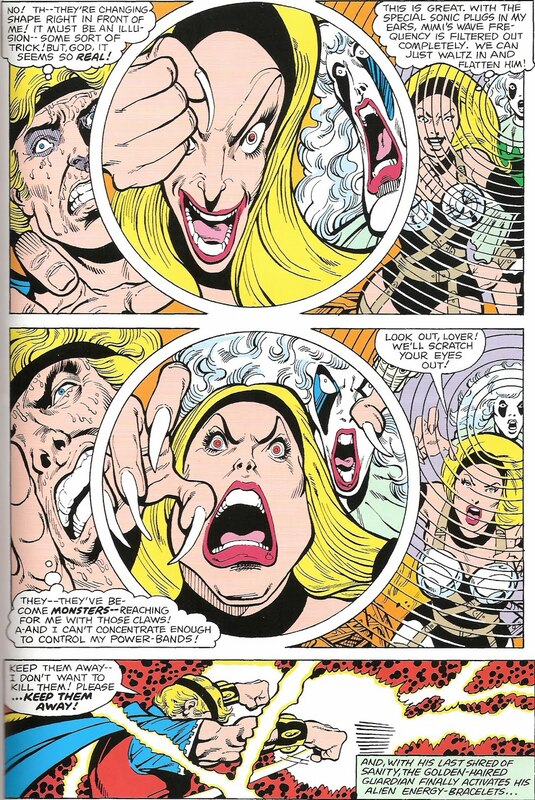 Our two heroes split up to go after them, and Quasar runs into Letha and Screaming Mimi. Quasar, ever chivalrous, fires a couple of warning shots and tells the two he doesn't want to "use real force on two women." The aptly named Screaming Mimi then cuts loose with a super-powered howl that causes Quasar's vision to distort - Perez' art here is very effective in getting across the feeling of disorientation. Eventually he overcomes his concerns about hurting the two and lets loose with a blast that drops them. As a side note, Screaming Mimi would go on to become Songbird of the Thunderbolts. It's a much better look in my opinion! Doug: I really liked the panel with Giant-Man and Quasar working. I've said I'm a sucker for characters who are giants, and the perspective in that panel adds to the awe of it. Doug: You are spot-on in your assessment of Perez's pencils on the Screaming Mimi scene. That is just really, really well done. I could get a sense of vertigo just looking at that page! Perez's choices of camera angles really added to the speed of the battle. The panel where Quasar flies across the floor into the wall is good, too. Karen: While Quasar is busy with those two, Giant-Man has his hands full with Titania and Poundcakes. G-M has a tough time with the two of them, getting knocked into a fiery pit, and then nearly having his arms torn out by the two, before he finally manages to knock them out. 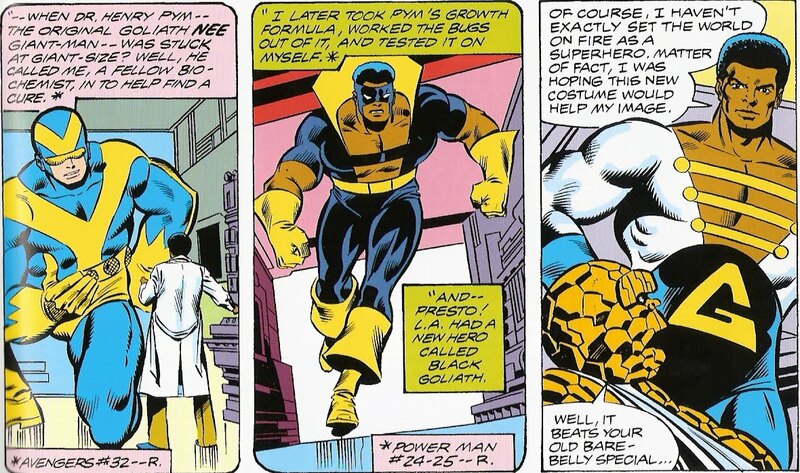 Doug: Bill Foster has gotten about as much respect in this story as his mentor, Dr. Henry Pym! Karen: Truer words were never spoken. What is it about giant-guys? Karen: Meanwhile, Ben is having his own problems with a certain Femizon. I got a chuckle out of the panel where Thundra has Ben on the floor, twisting his head, and yet proclaiming how the two are destined for each other! Doug: Isn't that how all women behave? Karen: Very funny sir. Ben manages to get back up and the fight continues, while Ben gives Thundra a lecture about true love. Eventually it comes to a screeching halt -with Ben caught in a scissor hold by Thundra! - when Quasar, Giant-Man, and the security team arrive with the other wrestlers securely in hand. Ben asks Thundra to come clean, but even though she feels betrayed, she has her honor and keeps silent. Doug: Ben's line to Thundra about not being able to shine Alicia's shoes, followed immediately by "ya blasted tomboy!" was priceless. This is a really great fight scene, really well-choreographed. You could see this playing out on the silver screen in a sort-of Matrix-style battle. Karen: Our story concludes with that scurrilous scientist, Dr. Lightner, recovering the device Thundra planted. With it, he will have all the components he needs to make the Nth projector, which certainly sounds ominous! Karen: You noticed that too? There were a few times during this series when the writers seemed to feel the need to throw some 'jive talk' in there. 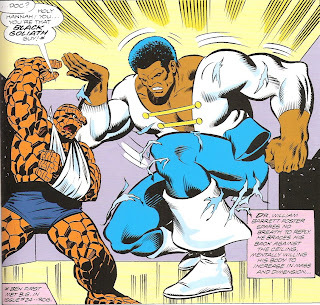 I might expect that from Luke Cage, but from Bill Foster? A biophysicist? This issue was a lot of fun; once it got going it was primarily one fight after another, and yet all were entertaining. As we re-read this little saga, I'm reminded again of how well all the characters were integrated into the story. Each had their own problems that they were dealing with and got the spotlight at different times. Yet Ben is always the center of the story as a whole. This is just a very well-crafted story, and the art has been fabulous. 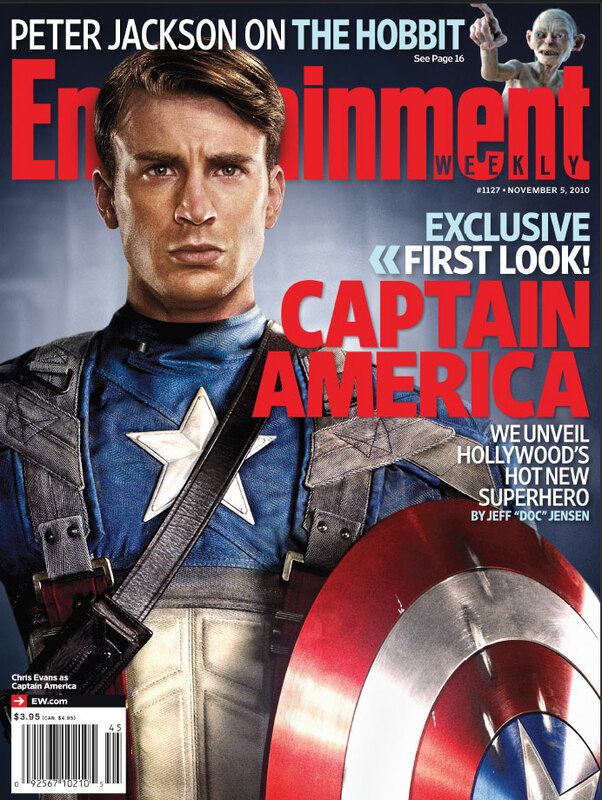 Karen: Entertainment Weekly will feature Chris Evans in his red-white-and blue suit on the cover of their next issue. Pictures have leaked out all over the web, so we figured BAB might as well join in! Check out the photos at comicbookmovie.com.There's been a few tidbits leaked. For one thing, Cap heads up a unit called the "Howling Commandos" -uh, excuse me? Isn't that Nick Fury's job? We also get two costumes in the film, which you can (sort of) see in these two photos. The one on the right, under the torn up jacket, is the cloth style costume we comics fans are familiar with. Apparently Cap feels it isn't tough enough, and asks Howard Stark (Iron Man's papa) to make him a better one -and a better shield. 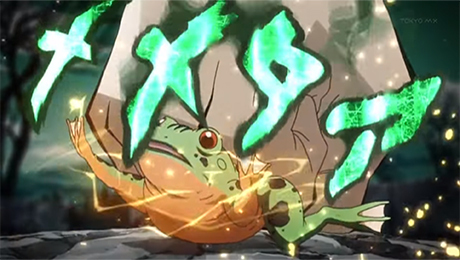 The result of that is shown on the left. 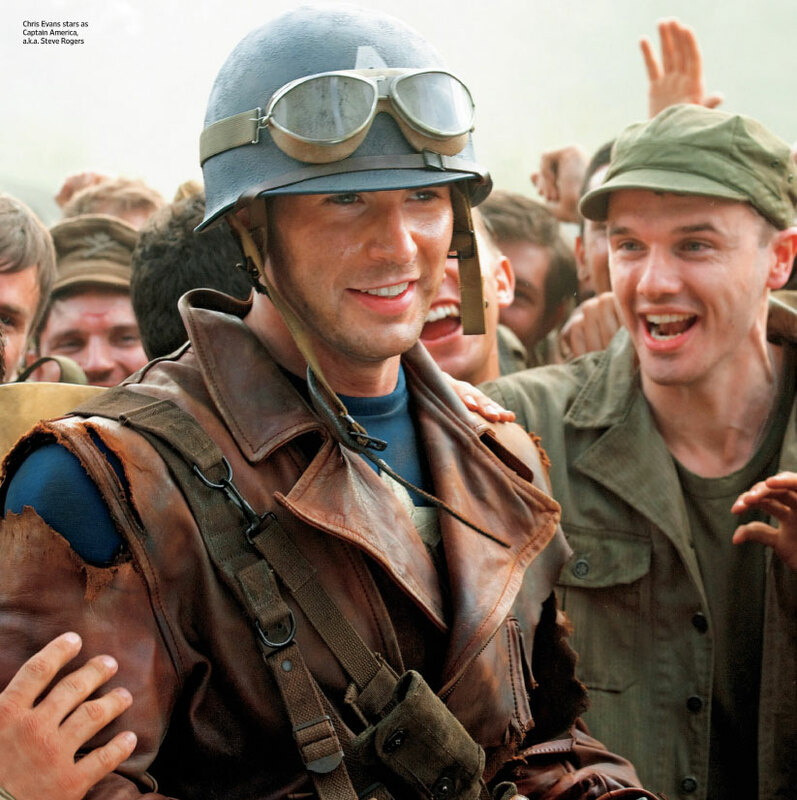 Doug: I wondered if the "Howling Commandos" reference wasn't more of an homage? I am certain they are not going to retcon Fury back to WWII. I like the Howard Stark inclusion -- that ties things together nicely. I also notice that in a picture of Hugo Weaving as the Red Skull, he has a Hydra patch on his sleeve. This seems to also tie into the new Avengers cartoon, where Cap was fighting Hydra -are they a group within the Nazis? Will the Nazis even be mentioned or are the film makers shying away from that, and if so, why? I'm still not sure what to think about this film. But I'm trying to keep the faith! 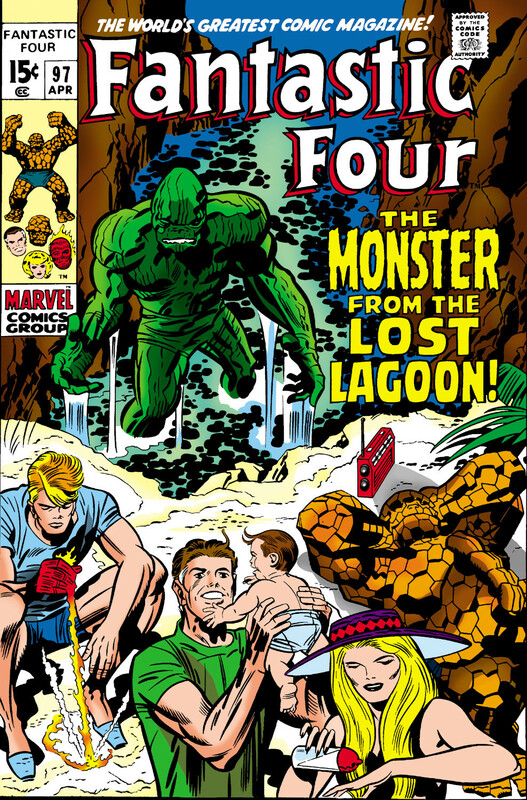 Monster Comics: Awesome or Awful? Karen: With the loosening of the Comics Code in the 70s, Marvel went bananas and flooded the market with a ton of monster comics and magazines - there was Tomb of Dracula, Werewolf By Night, The Frankenstein Monster, The Living Mummy, Man-Thing, Dracula Lives, Monsters Unleashed - and on and on. While many of these titles eventually fell to the wayside, some had a fairly decent run, and Tomb of Dracula in particular is well-regarded. Karen: So what say you? Did you dig these books, or did you want to drive a stake through their hearts? "The Gentleman's Name is Gorgon!" and "Among Us Hide... the Inhumans!" 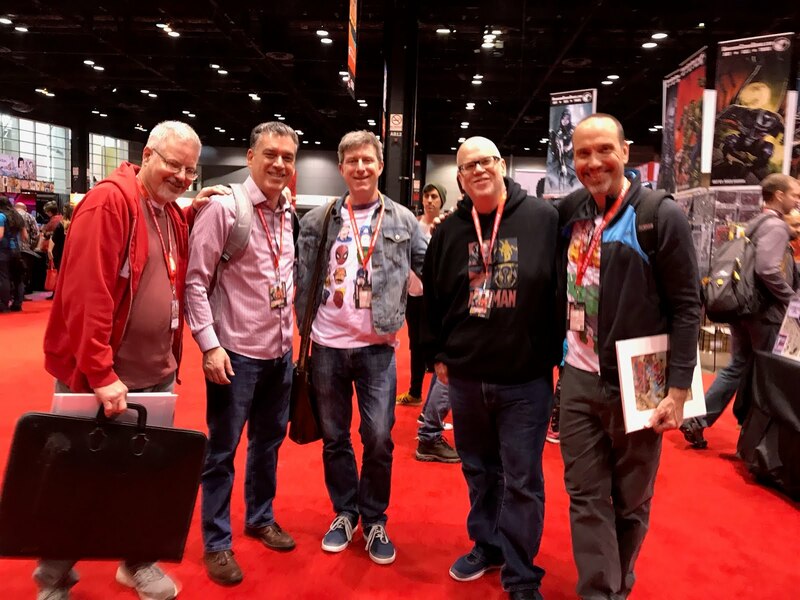 Doug: Hi, Lee/Kirby fans! 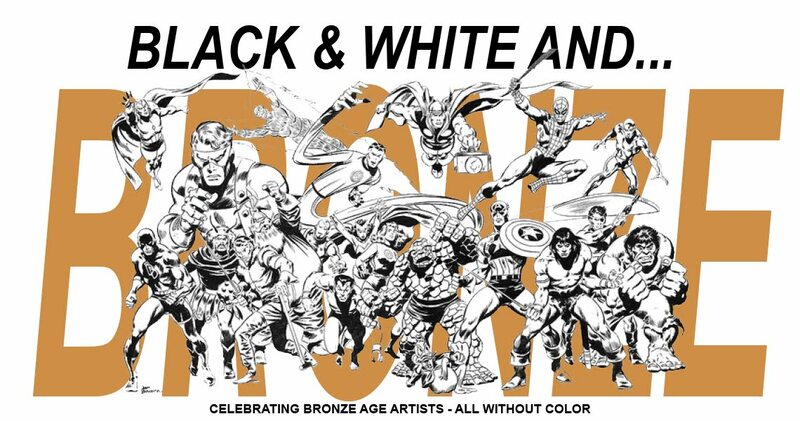 It's been many weeks since we took a look at Marvel's wonderful reprint titles that allowed the Bronze Age babies amongst our readers to catch up on the early years of the Marvel Universe. Today we have a double-feature for you, but Marvel's Greatest Comics actually contained three thrilling adventures! We'll be looking at the first two entries -- the third was a reprint of Strange Tales #130, when the Torch and the Thing met the Beatles! Karen: It was right around this issue that I started reading MGC. A good point to jump on! Doug: Our opening tale takes place shortly after the wedding of Reed and Sue, which had taken place in Fantastic Four Annual #3. As we join our cast, Reed is perfecting a fully-automated dishwasher -- what a guy! Of course, these were the days when every woman in the MU was not only needy, but dumb! And Stan never let us forget it. After the usual in-house strife, Johnny gets ticked off and heads downstairs for his Stingray. He's surprised that he left it on the street unlocked. As he drives off, he's knocked off-course by a shockwave, followed abruptly by a woman's voice and a gun to his head! Now wait a second... Even though Medusa compliments Johnny for installing a jump seat, have you ever seen a 1965 Stingray? Her hair, let alone her body, wouldn't have fit in any back seat. Karen: Is it just me, or did Johnny seem a whole heck of a lot more interesting back in these 60s issues? Maybe it's because I hadn't tired of his immaturity at this point. Do they even show Johnny's interest in cars any more? Doug: Back at the Baxter Building, the unknown shockwaver has knocked everyone off his/her feet, and is scaling the outside of the building! Ben goes out to catch him, but our foe has taken a copter from the good guys. Turns out he smashed the Fantasticar and the Pogo Plane, too! Back to Johnny and Medusa, they're now hiding out near State U., where Reed and Ben -- and a certain Victor von Doom -- had attended college (you don't think a big brain like Reed would have gone Ivy League, or maybe to MIT?). Johnny decides to make a break for it; however, a flame-on later and the heat wakes up the dormant Dragon Man! Now we got some trouble! Karen: I just love Dragon Man. He's a perfect example of the goofy yet cool Kirby style! Doug: The rest of this one is one big, ongoing slugfest. Our mystery stomper is revealed to be Gorgon, and is of the same "race" as Medusa. He asks the FF if they've never considered how Medusa got such crazy hair. Well even if I'd wondered, I wouldn't have associated that with a dude sportin' shockwave hooves! Dragon Man's sort of the wild card in all of this -- he thinks Medusa reminds him of Sue, then Sue shows up, then Ben's move to protect them is misinterpreted so DM wallops Benjie, then Gorgon whoops DM... 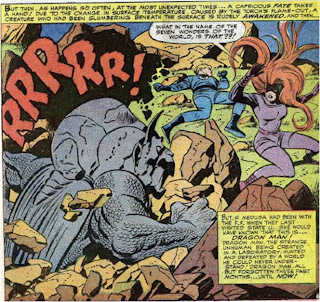 It's Kirby at his frenetic finest! The opening act ends with DM grabbing the girls ('cause that's how Stan writes them) and flying away, while Gorgon crushes the building on which the boys were standing. Karen: This issue really had everything! 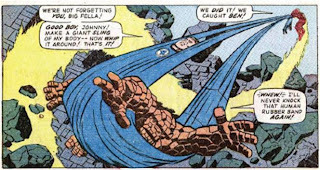 But of course, that was the hallmark of this period of time in FF history -Stan and Jack were just over-flowing with creativity, and did the greatest universe building in the history of comics right here in these issues, and the ones to follow. Doug: First we see the Sandman and the Trapster trying to bust out of jail, then we see Johnny return to the Baxter Building with Dragon Man and Sue. DM's a mellow fellow now, until a few pages later when Ben sets him off again. Then we see Johnny trying to get ahold of Dorrie Evans, to no avail. So he does what any 18-year old kid would do -- he goes for a walk (?). Karen: Trapster and Sandman now added to the mix! Who's next, Sub-Mariner? The Watcher? It must have been great to be a fan reading these books as they came out. Every issue was loaded with surprises! The fracas between Ben and Dragon Man was a hoot. I laughed when Reed turned himself into a cube to get between the two of them! Weird stuff, but wonderful. The exchanges with Dragon Man also gave us a chance to see Ben again mourning his 'monsterness'. Doug: Johnny ends up in a rundown section of town, where he spies a beautiful girl sitting all alone in a tenement. Try that one today in New York. He approaches her and a whirlwind kicks up, knocking him to the ground. He goes back home and helps Reed and Sue with some stuff, but daydreams his way through it. He gets mad at Ben, so he decides to try to find the girl again. Lo and behold, he finds her in the same place. Johnny startles her, she runs, and gives him another dose of earth, wind, and fire. Johnny flames on, and the girl gets excited about it rather than frightened. She introduces herself as Crystal, and says that Johnny must be "one of us". Doug: Johnny plays along, and Crystal takes him home to meet the family. Whoa... Once inside the Inhumans' headquarters (or maybe just "quarters"), Johnny is introduced to Karnak, Gorgon, and Medusa! He also meets Triton. This first look at the Inhumans is quite a slow reveal, and initially they really differed in tone, and to some extent (Triton) looks as well. But the basic framework is there. Of course, Johnny gets into another fracas, he is able to burst free and alert his teammates, and as they respond to the flaming 4, Karnak chops off a piece of wall to hurl at them. Ben's able to save the team from the projectile, and as he challenges the Inhumans, another wall explodes to reveal... Black Bolt! Karen: The Inhumans come off pretty darn arrogant! I also liked the mystery surrounding Triton, who later became my favorite Inhuman. The "Munsters" reference seemed wholly appropriate. 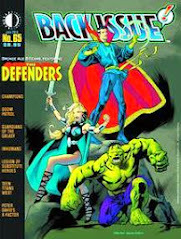 Doug: This was a fun little romp, and it really serves to show how much of what we know and love about the Marvel Universe was created in the pages of the Fantastic Four. Jack Kirby was at the zenith of his powers in this title, and Stan for the most part added to the fun. But, having read much about each creator, and about them together as a team, I can't help but wonder in some instances if Stan was walking all over Jack's margin notes. There's just enough dialogue here and there that leaves the reader doing a little head-scratching to make me wonder if what hit the newsstands was what the King intended. 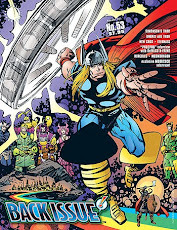 But at any rate, it's some good four-color fun, and I am glad that Marvel had the foresight, or hindsight if you will, to keep these stories fresh for the new (at the time) generation of readers. BAB Two- In -One: Fighting Fiends and Yer Mama's a Great Ape! Karen: Recently my contribution to one of our Two In Ones was Tomb of Dracula #18, which was the first part of a Dracula vs. Werewolf By Night story. At that time I didn't have the concluding issue, Werewolf By Night # 15 -but now I do! Courtesy of my recent acquisition of the Tomb of Dracula volume 2 TPB, which includes the WBN issue (whoever thought of that, thank you!). 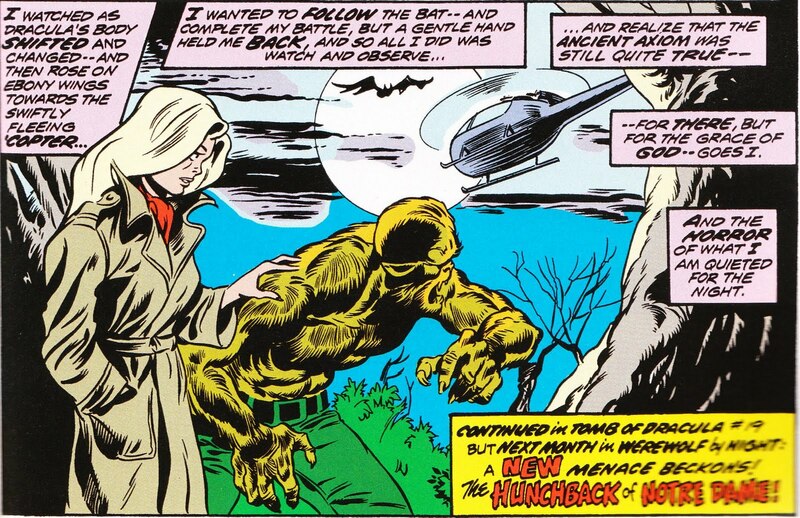 Karen: Werewolf By Night # 15 was also written by TOD scribe Marv Wolfman, and drawn by WBN artist supreme Mike Ploog. The story picks up right from the end of TOD, with Drac and the Werewolf in a pitched battle. 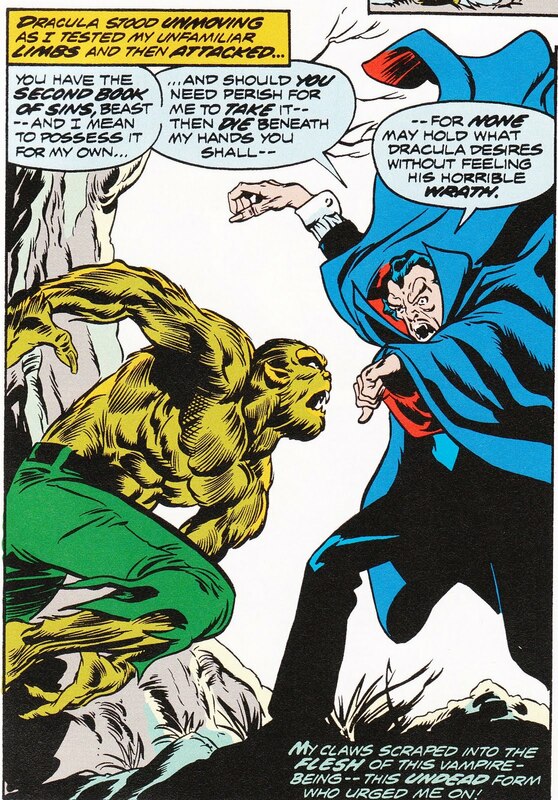 However, while Dracula appeared to be gaining the upper hand in his title, here the Werewolf ultimately does, and tosses the Count from the castle tower. However, Dracula changes into a bat and flies off. While Topaz and the Werewolf leave the castle, our vampire hunters, Rachel Van Helsing and Frank Drake, are arriving in a helicopter. Dracula attacks the copter but they manage to land safely. Karen: The next day, the Werewolf has reverted to Jack Russell and he and Topaz manage to unlock his father's diary. He reads it and discovers that one of his ancestors had actually staked Dracula! But the man was then bitten by a werewolf at the Castle, so Jack's lycanthropic curse is in some sense due to Dracula. This seemed pretty interesting, tying the characters together this way. Unfortunately I don't have many issues of WBN so I'm not sure if anything else was ever done with it. Karen: Later, Dracula returns to the castle in mist form and attacks Rachel and Frank -and then leaves! Oddly, rather than finishing them off, he heads off to the copter, to disable it, saying that he senses all four of his enemies will converge there. This just seemed a bit weird, maybe a case where the artist and writer weren't on the same page? In any case, Drac begins disabling the helicopter controls when the Werewolf shows up. Topaz has used her powers to enable Jack to be in control of his beastly form. Dracula realizes this as they fight. Before much of a brouhaha can ensue, the vampire sees Topaz holding the diary and declares he must have the book. Just as he takes it from Topaz, Frank and Rachel show up and get it away from him, taking off in the chopper, which apparently wasn't so disabled as we thought! Dracula declares that the book could be used to destroy him forever and he frantically pursues th e chopper in bat form, leaving Topaz and the Werewolf looking on. Karen: While I thought the quality of the story was a bit uneven, it was generally entertaining. I much prefer Ploog's sinewy Werewolf to Colan's interpretation, but Colan's Dracula is the definitive one. Now I really want to get my hands on some more Werewolf By Night comics! 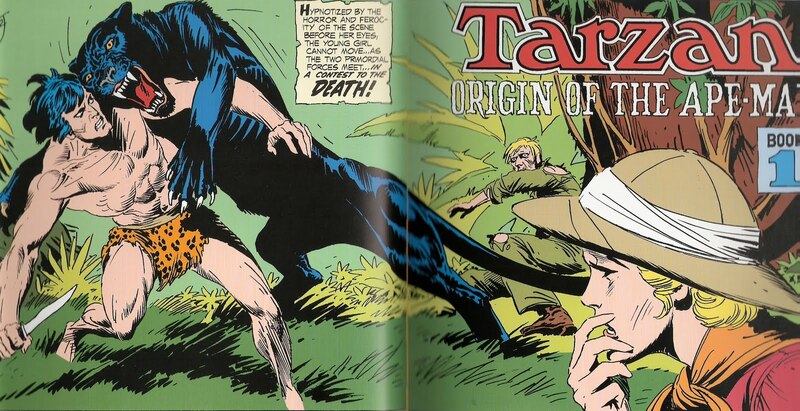 Doug: Back before htmlcomics.com got really well-acquainted with the FBI, it had been my slithering intent to do some Tarzan reviews from the very excellent Joe Kubert years over at DC. I, however, made myself an honest man during a visit this summer to Geppi's Entertainment Museum while on vacation in Baltimore. In the museum store I spied the three volumes of the Tarzan Archives (now published by Dark Horse Comics). They were on the scratch-and-dent table for -- get this -- $10 apiece!! Yep, $150 worth of books at 80% off! Dumb luck -- that's me! By the way, I would most strongly recommend that if at all possible a visit to the Geppi Museum (and all of the other attractions near it) would be time incredibly well-spent! So today's fare is the premier issue of DC Comics' adaptation of Edgar Rice Burroughs' Tarzan of the Apes. 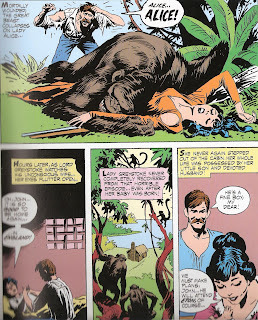 Tarzan #207 (April 1972), "Origin of the Ape-Man" continued the numbering from the Gold Key series. As the title moved to DC, veteran illustrator Joe Kubert took the creative reins as editor, writer, penciller, and inker. And it was a tour de force! Kubert's jungles are lush, his beasts menacing, and his ape-man lithe, yet powerful. The first issue in DC's reboot is a basic retelling of the Burroughs' novel, originally published in pulp form in 1912. Kubert, sensing that many a superhero movie takes 2/3 of the picture just to get the guy in the suit, opens with Jane and a guide (plus some porters -- you just have to have African porters!) 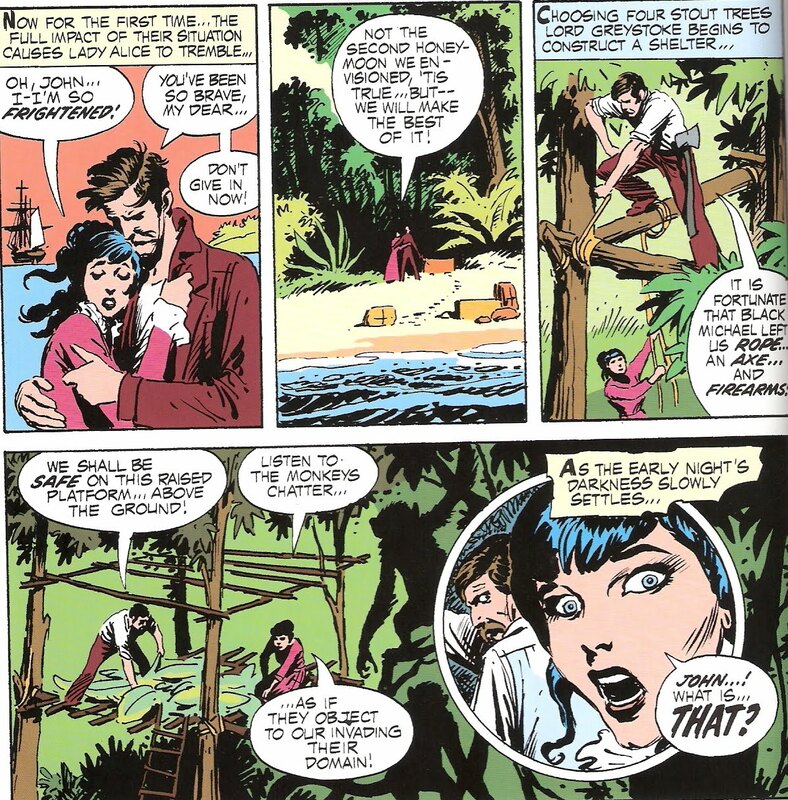 on a voyage through the jungle in search of Jane's missing father. Suddenly, a black leopard bursts through the foliage, only to be intercepted by a white blur of fury. Tarzan descends from above, saving the life of the guide while at the same time engaging the big cat. As quickly as it began it is over, and Tarzan vanishes. Jane tries to catch her breath, and the guide tells her what he thinks the man was. Kubert then takes us on a descent into what would be hell for any modern man. While sailing for Africa, John Clayton, Lord Greystoke, and his wife Lady Alice find themselves in the company of hooligans as poorly-behaved as the seas have ever seen. Later in the voyage, as the crew mutinies, the Claytons are protected by Black Michael; however, stating that he could never protect them forever, Black Michael forces the Claytons to disembark amidst the African jungles. Leaving only a rifle and ammunition, and an axe, the crew leaves. Lord Greystoke builds first a platform, then later a cabin to protect his wife from the denizens of the jungle. Lions, monkeys, and the great apes all at one time or another pay a visit -- sometimes a menacing visit. I've always been enthralled by Burroughs' apes -- neither gorilla, chimpanzee, nor orangutan -- they are almost an amalgam of all three. Kubert succeeds in making us believe they are real. On one fateful day one of the bull apes surprises Greystoke and it is only his lady's quick action with the rifle that saves them both. However, before the ape died it lurched at Lady Alice, knocking her to the ground. Her unborn child unharmed, the heir to the Greystoke name was soon born. However, the trauma left Alice homebound, and a year later she died. As John Clayton grieved, elsewhere nearby the leader of the local ape tribe, Kerchak, menaced his fellows. Gnashing his teeth and striking out, he eventually began to chase Kala, she a new mother herself. In the melee, the young ape was dropped to his death. As Kerchak's rage suddenly left him, he rallied his troops and set off for the cabin by the sea. Kala went to her now-dead baby, and clutching him fell in line with the rest of her "people". Attaining access to the cabin, the apes poured in and overwhelmed Lord Greystoke. Kala, seeing the newborn human, grabbed him and left her own in his place. She would defend the strange-looking infant as he grew. The remainder of the tale follows Tarzan's younger years, culminating in his discovery of the cabin and seeing books for the first time. It is only then, when he was about 13 years old, that he discovered that there were others who looked like him. And it was also on that first voyage to the "nest" that he found and appropriated his father's hunting knife. 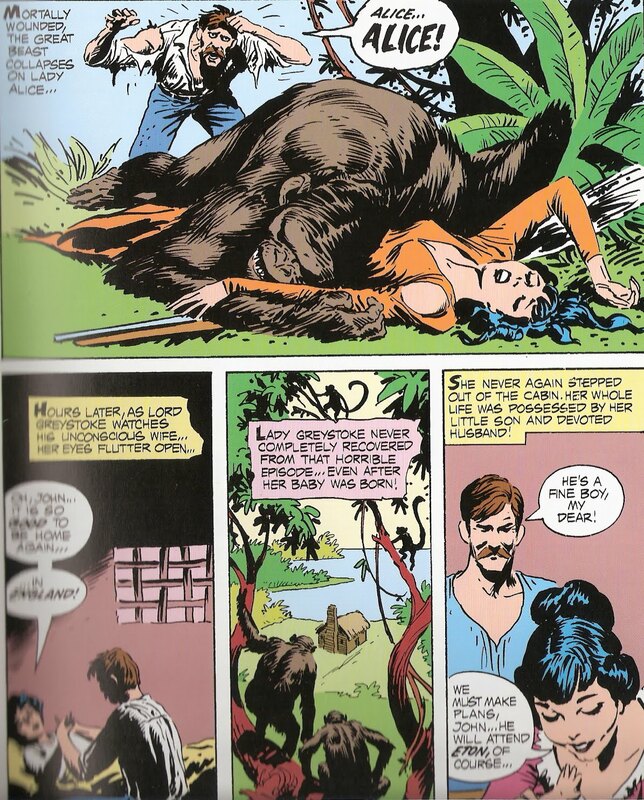 Sensing the moonlight and the need to return to the tribe, Tarzan left -- only to be confronted by Bolgani the gorilla. With self-defense as his sole option, Tarzan engaged the huge gorilla and plunged his new blade into the beast's hide again and again and again. And as the two of them collapsed -- Bolgani in death and Tarzan in exhaustion, it was this singular event that would start the Ape-Man on the path to leader of his people, and toward becoming a legend. Kubert spreads Burroughs' first story over multiple issues, and it's my goal to begin a series here, much like Karen had done with the Deathlok stories she'd reviewed from Marvel's Astonishing Tales. These are fantastic stories, and Kubert's writing and art seems a perfect fit for them. While John Buscema would add his own interpretation to the jungle lord later, Kubert's interpretation is perhaps more fitting -- the length, the grace, yet again the power kept are fine attributes of this Tarzan, and make these stories Bronze Age classics! Which Characters Don't Even Register on Your Care-o-Meter? Doug: OK, maybe the title is a bit harsh. But, are there characters who you really just don't care about? Maybe you've never read anything about them, or even a book they were in? Is there someone out there that you keep asking yourself, "What's the big deal?" For me, the guy at Marvel who fills that bill is Deadpool. I was never a Rob Liefeld fan, never got into the New Mutants or X-Force, so that entire line of characters has largely gone by the wayside in my brain. 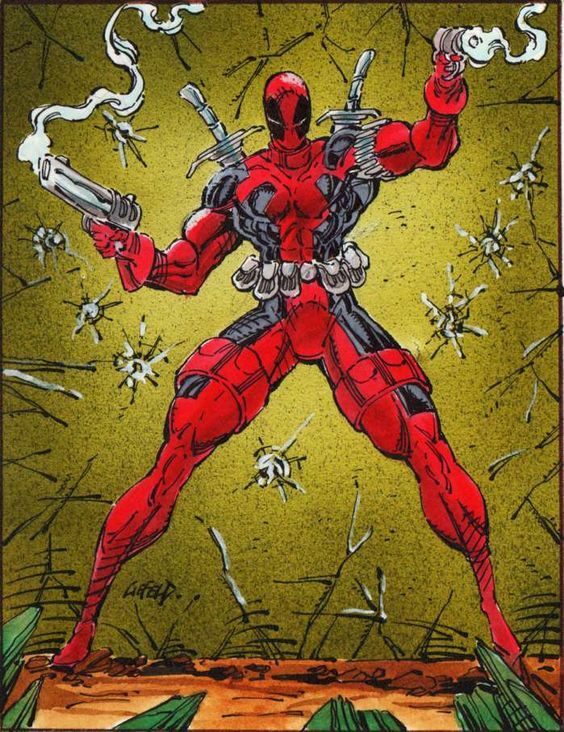 I know Deadpool is popular, but he's just a gun-totin' blowhard to me (by the way -- check out the left forearm in the image to the left... I say "Image be damned!!"). He just doesn't resonate with me. I wouldn't say I hate him -- I'd just say he doesn't register anytime on my Care-o-Meter. And, over at the Distinguished Competition, it has to be Firestorm. I believe he came 'round during the period I was out of comics (early 1980's -- I could be off a bit). So when I got back in, I saw his books on the spinner racks, saw him in the JLA, but just never found the character, the look, or the backstory attractive. I mean, again, I don't hate on the guy -- just don't really have any involvement with him, no attachment. Doug: Hey, hey -- Project Pegasus, part three lands today! So far we've seen Ben established as a security honcho at PP, a budding friendship between he and Quasar, Wundarr in a coma-like state, Thundra rasslin', a strange version of Deathlok, and a mole named Lightner who is trying to throw a big monkey wrench into our heroes' lives. 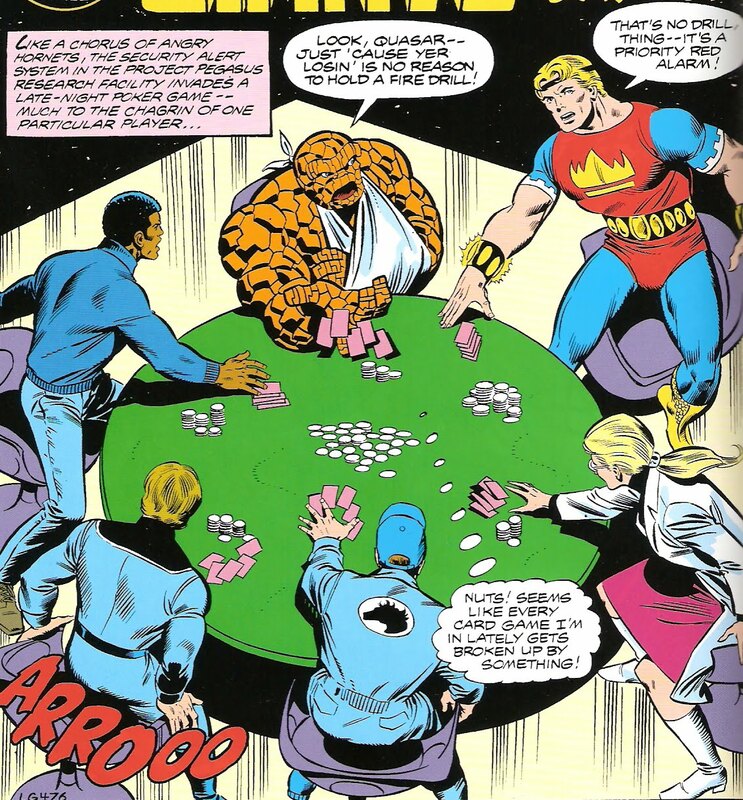 So let's hit the ground running with this one, as we open with a super-hero poker game! Karen: Ben and poker games would become synonymous after this. There were a number of times in later stories where he and his super-hero friends would play cards together. Doug: As fate would have it, the cards are interrupted by a security alert. At the conclusion of issue #54, bad boy Lightner had unleashed Nuklo, the radioactive mutant son of the Whizzer and Miss America. Nuklo is a glowing giant but with an infant's mind. Now he's on the loose, wandering about like any confused child lost in a department store would. As Ben, Quasar, and the other operatives make their move, Ben falls in with resident big brain Bill Foster. Karen: What is it with Ben and super-nerds? Just as an aside, I really liked the map of Project Pegasus in issue 53, and we get another look at it, on a monitor, in this story. It was just a little something extra that was fun. Doug: I recall Foster from his days in the pages of the Avengers, working alongside Hank Pym. I enjoyed the brief time Foster had his own mag as Black Goliath, and felt his guest-appearance in the Champions was all too short. But I have to tell you -- in this book he is anything but a hero. Here's why: Foster and the Thing are on an elevator, when (unbeknownst to them) Nuklo stops it from moving, and then begins to drive the car upward to the ceiling. Ben tries to stop it, but with a wounded wing (from Deathlok in the last ish) he proves ineffective. To his shock, Foster suddenly bursts out of his civvies and emerges from the rags a Black Goliath! Karen: You think it was unheroic because Foster didn't grow immediately? I don't know, I never thought of it that way. I just assumed it took him a few moments to do it. That's funny how we interpreted this scene so differently! Karen: I see. I agree with you regarding his Champions appearances -I'd have liked to see him become a regular. Of course the title itself didn't last very long. Now his claim to fame is being killed by that odious Thor-clone in Civil War. The guy really got a raw deal pretty much his entire career! Doug: Nuklo tires of the game and wanders away, as Foster recounts his origin to Ben. 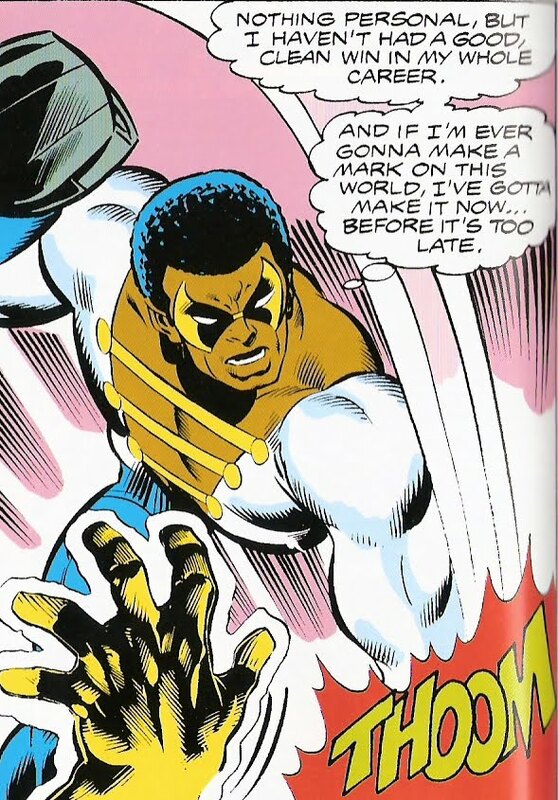 Ben suggests that Foster, who's expressed a lack of confidence in the hero game, make a clean break with the Black Goliath identity and rechristen himself Giant-Man. He does, and off they go. Meanwhile, Quasar has figured that it's Nuklo on the loose and attempts to channel the radioactivity through his wristbands and out of the facility. Then we cut to Thundra, wrestling at Madison Square Garden. Only this time she loses, by dishonorable means. Karen: Foster's new costume has a little more pizazz than the previous one. 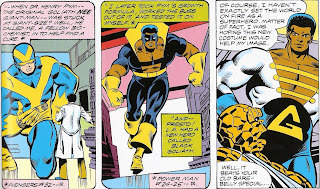 I liked Ben's suggestion to Foster to rename himself Giant-Man, because we finally moved away from that silly Black Whatever that all African American heroes from this time period seemed stuck with. As Ben said, "It's pretty obvious you're black." Doug: Ben also remarked on the "bare belly" aspect of that former suit... Remember when they tried that with Ms. Marvel as well? It was, after all, the Swingin' '70's!! 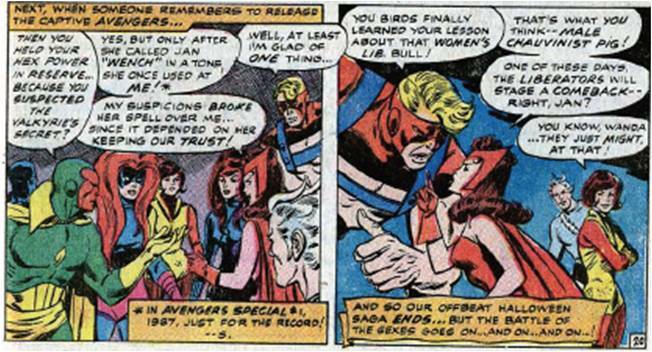 Karen: The fight between Thundra and the cheating Titania was well-drawn but seemed a little long. I'm surprised a needle could easily penetrate Thundra's skin, but then, I don't know if she was ever considered to be all that invulnerable, despite her strength. Doug: As Ben and Giant-Man round a corner, they see one of the Project's doctors seemingly being menaced by Nuklo. Foster wants to charge headlong into a fight, but Ben stops him. Ripping open a lead door, Ben molds the metal into "gloves" and affixes them to Giant-Man's hands. Now the battle is joined. And it's really sort of sickening. 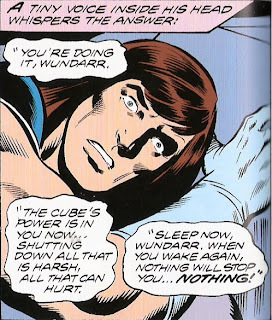 Authors Gruenwald and Macchio had played up Nuklo's mental level, and Foster's brutal onslaught (all the while rationalizing to himself that he's just gotta make an impression as a hero) just gave me a sense of child abuse. Karen: I understand what you're saying. Seen from that angle, it does look pretty ugly. However, I was never sure if either Ben or Giant-Man really knew that Nuklo was mentally handicapped. I liked the fact that Ben was canny enough to make the lead gloves for Foster. He's an old vet and should know stuff like that. Foster's eagerness to make his mark seems excessive, but makes more sense by next issue. I actually felt a little sorry for him when Ben sends Nuklo flying. 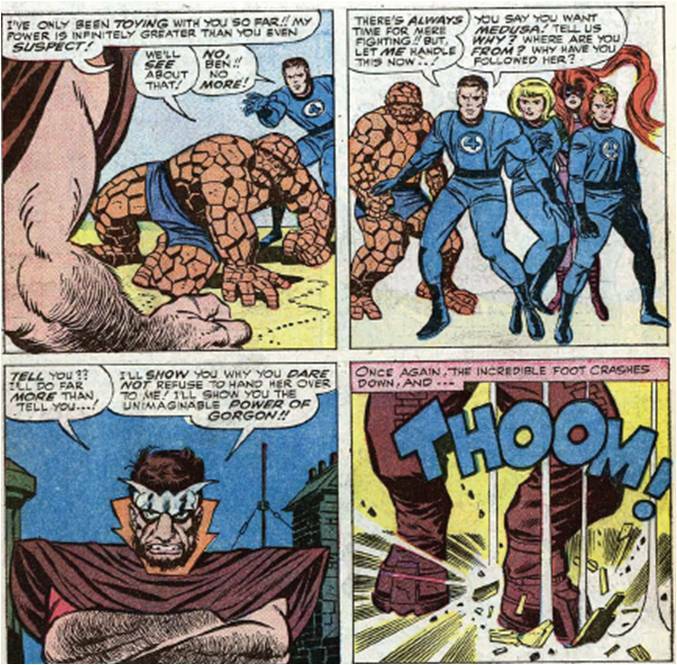 Compared to the power Ben possesses, Giant-Man is strictly minor leagues. Doug: Yep, it's actually Ben who ends the fight, with one punch. And it's a lucky one, as Nuklo ends up in a sort of anti-grav stasis ring. 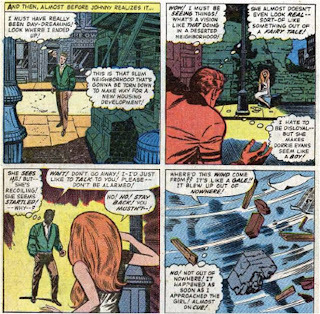 Giant-Man gets introspective in a self-pity-party, and then the boys get their butts chewed by Nuklo's scientist-guardian. 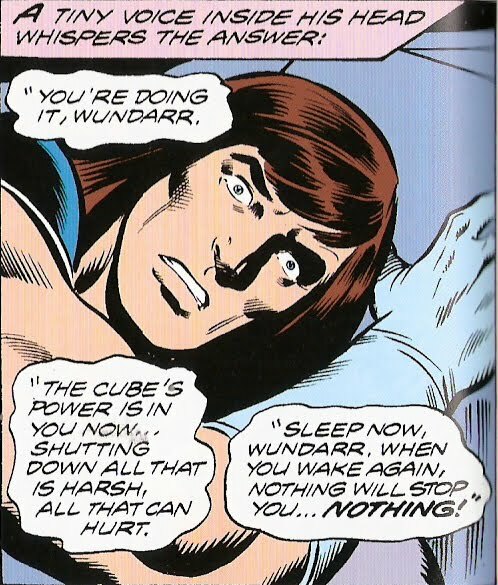 Lastly, we get a recap of Wundarr's origin and backstory, and then the mystery really deepens as Wundarr suddenly snaps awake to the sound of voices in his head, telling him that when he awakens for good -- nothing will stop him! Sidekicks and Partners -- Who Are Your Favorites? What Was the Watershed Event of the Bronze Age? What if Scooby-Doo Worked for the House of Ideas?